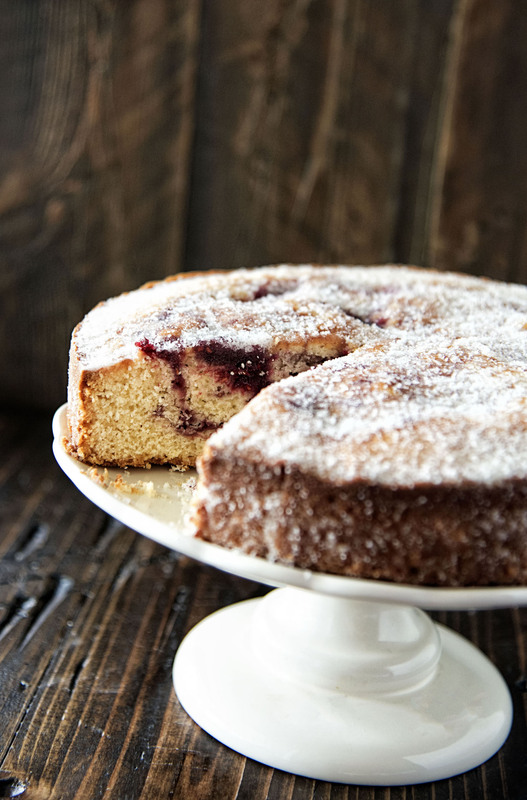 Sweet Corn and Berry Sugared Donut Cake: Cake made in the spirit of sugared cake donuts. 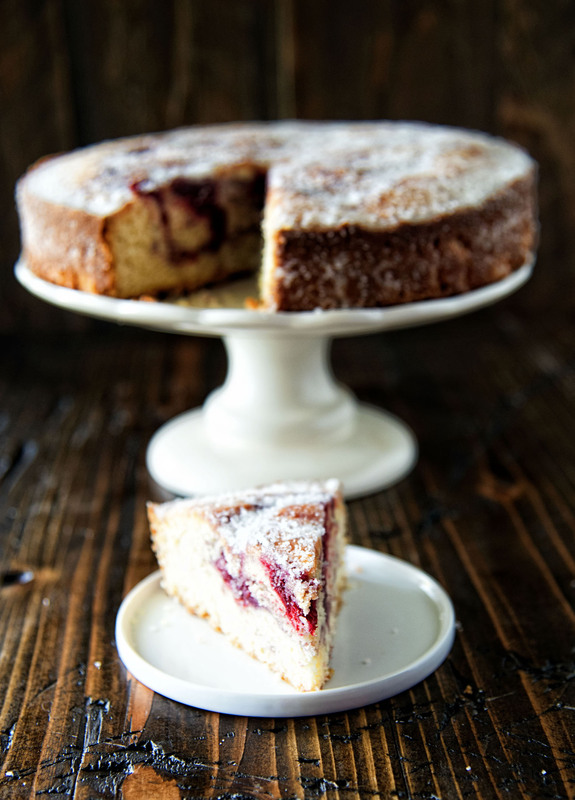 Dense cake scented with sweet corn and swirled with homemade berry jam all coated in butter and sugar. The Internet gets a lot of hate. Social media gets a lot of hate. It gets a ton of hate as of late in it role in our political climate. I might point out that the people writing and sharing these things articles are the issue but whatever. But I want to talk about the good the Internet can do. Today I reached $8000 raised for Old Dog Haven. Most of my donations did not come from friends and family. No, most of my donations, a good 3/4 came from strangers. Strangers who follow my dog’s Instagram account, follow this blog, and follow me on Twitter. Sure the amount is amazing but what is amazing is no one asked if the dogs were Democrat or Republican. They just saw dogs in need and gave. Some gave $500. And some gave $5. Each donation means the same thing to me. These dogs matter and my efforts to help them matter. There are other teams who are close to our number of money raised. But what I love best about the money I have raised for these dogs is the variety of people it came from. Every year at a hockey tournament they throw for my birthday I make Jell-O shots for free but suggest they make a donation. Fifty plus guys (and gals) play in this tournament. While not all donate (or drink) a good solid amount of them do. Former students of mine have chipped in. My ex-husband, who also does the walk in honor of Crazy Cocker Spaniel, does. Hockey players from my team. A good chunk of my dog Mickey’s Instagram followers. Amazingly Twitter. I saw that because that really is strangers. From a tennis star’s wife to the dog (who is a Cavalier as well) of a very, very well known actor. There is less than 24 hours until the walk. I am still collecting because the dogs still need the money. If you want to help you can donate HERE. Now, on to this cake. We all know I have an obsession with sweet corn. And this year with all the berries I keep getting from my friend I could not help but make a dessert combining the two. Sweet Corn and Raspberry Ice Cream is still my favorite ice cream of all time. So I figured I needed a cake to go with it. This cake is like a cake donut in texture…that’s why it’s called a donut cake. The piping of the batter half way through may seem like a step you want to skip…don’t. I have make this both ways and you need the piping to stop the jam from escaping. Stir with a wooden spoon, and let stand for 2 hours. Reduce heat to medium, and cook, stirring frequently and mashing berries with a potato masher, until mixture thickens, 20 to 45 minutes. Remove from heat, and let cool for 1 hour before transferring to a clean jar. This makes more jam than what is needed for the cake. But it’s tasty on everything. Jam will keep refrigerated for up to 2 weeks. In a large sauce pan add the milk and sweet corn, both cob and pieces. Bring to a boil and once boiling turn off heat and cover. Let sit for 10 minutes. Remove cobs. Strain corn pieces out of milk. Reserve 3/4 cup sweet corn milk for recipe. In a medium bowl, whisk together flour, sugar, baking powder, salt, and nutmeg. In a large bowl, whisk together 3/4 cup sweet corn milk, melted butter, eggs, and vanilla bean paste. Add sweet corn milk mixture to flour mixture, stirring just until combined. Spoon remaining batter into a large piping bag. Pipe a ring of batter around the inside edge of the pan. Spoon Quick Berry Jam into center of the ring. Pipe remaining batter on top of jam, and smooth with an offset spatula. Bake until a wooden pick inserted in center comes out clean, 55 minutes to 1 hour, covering with foil during last 30 minutes of baking to prevent excess browning, if necessary. Run an offset spatula around edge of pan to loosen cake before turning out. Turn cake back over (so dome is on top). Brush top and sides of cake with melted butter. 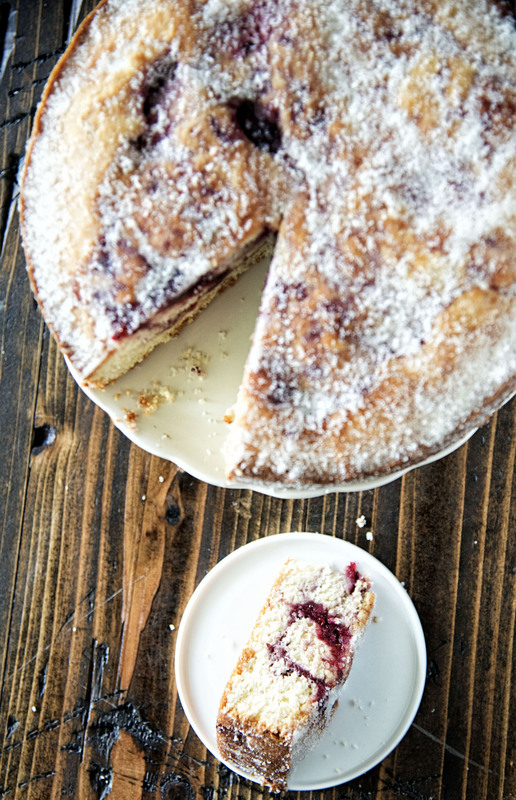 Sprinkle top with sugar and press into sides of cake.